There’s little debate any more about the importance of IT to the success of modern organizations. Of course the meaning of “success” varies depending on the organization type. For traditional business it’s typically a matter of metrics like market share, revenue growth, and profit. In the world of higher education, meanwhile, the yardsticks are more varied, involving not only financial health but measures like completion rates and research leadership. Even so, IT has a central role to play in both arenas. Institutions that leverage digital technologies in a strategic and prioritized way can enhance their ability to achieve successful outcomes for students, researchers, and the organization as a whole. That means embracing the cloud, putting the network at the heart of learning, research, and operational systems. And as with digital business transformation, this digital higher education transformation can only succeed if it’s anchored by modern network visibility. Successful outcomes are driven by digital transformation. Digital transformation isn’t about change for the sake of change; it’s guided by the goals of the organization. 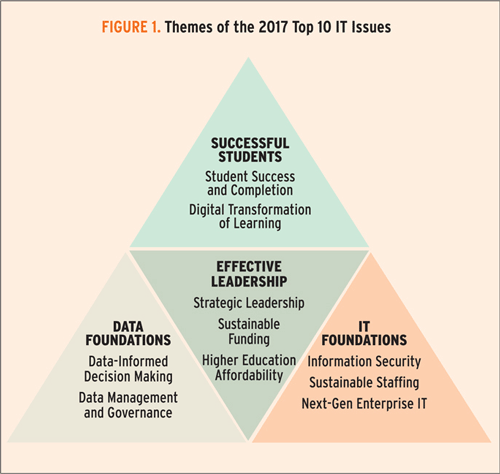 In higher education, the priorities that IT must serve are encapsulated into the above diagram from an article, published in the January 2017 issue of Educause Review, by Susan Grajek and the 2016-2017 Educause IT Issues Panel. The diagram shows student success as the driving goal; at research-heavy institutions, research success would be given equivalent weight. The desired outcome at the top of the pyramid is directly supported by digital transformation, which involves a hybrid cloud approach that includes traditional IT infrastructure and home-grown applications as well as internet-based open source tools, IaaS/PaaS/SaaS, and Web APIs. The rest of the pyramid in large part underscores the importance of digital transformation to all aspects of IT. Data-driven decision-making, enabled by big data, must not only influence student analytics but drive a continuous deployment of optimization across the IT landscape, shepherded by sound data management and governance. An organizational orientation to “data-drivenness” helps to deliver on a solid IT foundation. For example, data-driven learning and optimization lead to effective automation, wiser enterprise IT investments, and smarter information security. Leveraging and showcasing this data-driven efficiency and ROI helps IT organizations make the case for more stable funding, which can help create a sustainable staffing environment, while also contributing to improved overall affordability in higher education. As the diagram shows, the network is obviously a critical part of next-generation education IT. But its influence goes far beyond simply acting as digital “plumbing.” After all, the network doesn’t just support digital education transformation, it’s also in a unique position to see how well all that digital stuff is working. In the age of digital education and hybrid cloud, all those web APIs, SaaS tools, infrastructure, and disaggregated applications rely on a huge matrix of north-south and east-west network communications. Complicating matters, higher education IT has to offer network services to multiple user bases, including educational and administrative departments, grant-driven research projects, and large residential student populations. Performance, efficiency, and security depend on modern network visibility. Data-driven decision making: A big data network analytics platform makes the vast and valuable details generated by network telemetry useable. Legacy network monitoring tools don’t have sufficient storage or computing power, so they discard details and instead retain summary reports that shed zero light on important operations, security and planning decisions. The depth of details and speed of modern big data network analytics platforms allow for a virtuous cycle of analysis, learning, optimization, and automation that leads to better performance, staff productivity and continuous improvement. This leads in turn to more sustainable staffing, even in the face of rising demands. Better performance at lower cost: HIgher education organizations must support very high bandwidth internet throughput. Internet path-aware network traffic analytics helps network organizations find ways to reduce paid transit and increase settlement-free peering while delivering better performance for key internet-based apps and tools. More accurate DDoS protection: Higher education is a constant target for DDoS attacks. Dealing efficiently and accurately with attacks is the mandate because DDoS is a form of performance and availability overhead as well as a potential cover for more intrusive threats. Big data analytics have been shown to be superior in detection accuracy, leading to greater automation. And their open APIs allow greater flexibility. More pervasive security analytics: One of the biggest challenges for information security is how to corral data effectively for defensive purposes when security tools that have the power to examine issues deeply are too expensive to deploy pervasively. Big data network analytics helps by providing a platform that can store pervasively collected traffic telemetry and other data. This data can be used for anomaly detection of conditions that might escape view in other tools due to lack of deployment footprint, mistaken assumptions, or configuration entropy. What’s been keeping higher education from the advantages above? The cloud era has brought increasingly data-driven operation and automation, but network teams often remain stuck in low gear, with staff still primarily deployed on manual, CLI-based tasks. Much has been made of culture issues within IT, and networking in particular, but the major factor has been the lack of sufficient data to enable an alternative path forward. Kentik makes it easy to access and utilize network traffic data. With modern network visibility powered by big data, network teams can instead become leaders in digital transformation. The raw materials of rich, pervasive network data are already available, and with Kentik Detect it’s now become easy to access a comprehensive platform for big data network traffic intelligence. Kentik’s SaaS solution is used by well over 100 web and digital business leaders, including web enterprises like Box, Yelp, and Pandora, telecom giants, and top-5 cloud providers. We also serve regional education networks like OSHEAN, OneNet, and Kanren, individual universities like University of Washington and UPenn, and even K-12 education organizations. To get a feel for what big data network traffic intelligence from Kentik Detect can do, check out our Pandora case study video. You can also find general information about Kentik Detect’s capabilities on our product pages. Best of all, see for yourself what Kentik Detect could do for your own network management operations: start a free trial or email us at info@kentik.com to schedule a demo.